IC updated for the September 2018 patch. [Sun Oct 07 23:21:22 2018] You have entered The Rathe Mountains. [Sun Sep 30 22:25:17 2018] You begin casting Gate III. [Sun Sep 30 22:25:35 2018] You have entered Guild Lobby. [Sun Sep 30 22:26:48 2018] You have entered The Plane of Knowledge. [Sun Sep 30 22:30:50 2018] You have entered The Gulf of Gunthak. [Sun Sep 30 22:33:26 2018] You have entered The Stonebrunt Mountains. [Mon Oct 01 01:32:07 2018] You have entered The Skyfire Mountains. [Sun Oct 07 23:24:02 2018] You have entered Misty Thicket. New zone detected, you have entered Misty Thicket. [Sun Sep 30 22:35:50 2018] You have entered The Warrens. New zone detected, you have entered The Warrens. [Sun Sep 30 22:40:42 2018] You have entered Paineel. New zone detected, you have entered Paineel. [Sun Sep 30 22:42:54 2018] You have entered The Ruins of Old Paineel. [Sun Sep 30 22:42:55 2018] You have entered an area where levitation effects do not function. New zone detected, you have entered The Hole. [Sun Sep 30 23:14:20 2018] You have entered Brell's Rest. New zone detected, you have entered Brell's Rest. [Mon Oct 01 01:35:52 2018] The raid leader has locked the raid. You may not invite new members until the raid is unlocked again. [Mon Oct 01 01:35:52 2018] You have entered Gorowyn: Balance of Power. [Mon Oct 01 01:35:52 2018] Your mercenary has been suspended. [Mon Oct 01 01:35:53 2018] You have entered an area where levitation effects do not function. Setting up session: Client port 55097, Server port 2329. SKey is 0x3ea15a38. New zone detected, you have entered Gorowyn: Balance of Power. I can go through more zones if needed but the Plane of Knowledge zone loses session connection every time. Thanks Byren for the info. 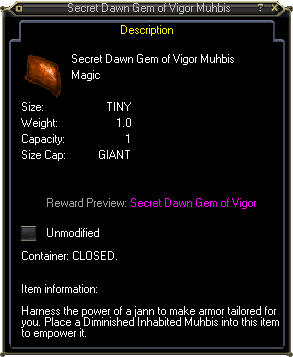 I've contacted the item collector developer about this. I'll let ya know soon with any new info. IC is collecting Data, and profiles are created, but I can not upload a profile to Zam. I keep getting "Error:Permission denied, incorrect login or not premium' ". I have uninstalled/'reinstalled IC, cleared Inet cache and cookies. I tried to upload from The Rathe and from Ragefire. I have zoned, and tried again, still happens. I am running IC as admin. I am running Win 10, and using Edge. What level is the character you are trying to upload? Also, in the profile section of IC, do you have the email address associated with your account set to your site account email address and of course the password set as well? I created a character on The Rathe and leveled it to level 2 in the tutorial and was able to upload my profile. I was using my Allakhazam login, not email, using the email worked, thanks! Item collector download locks at 46%. Tried from link on Zam and directly at Lucy. Could not get profiles uploaded so I thought I would install new. just and FYI. It finally completed, after about 10 minutes I guess. The installer is corrupted, will not work. Edited, Nov 25th 2018 11:37pm by Kwendal I restored the setop.exe from my Trashcan, and installed Item collector. On start it locks at auto-updating. Maybe a communication error with a server exists? Most likely you had a bad route to the server when you tried this which happens from time to time on the internet. Try again and see what happens. The item collector hasn't been patched for the latest game update so it won't read items. However it should allow you to upload your already existing character profiles. Still occurring. The Item collector, when starting tries to auto-update. The Auto-Updater window pops up and locks at about 3/4 complete (9 blue progress bars). I have to use the Cancel button to leave the Auto-Updater window. I can connect everywhere else. Still happening. I downloaded a new setup today. Still locks at 3/4 through auto-update and does not launch. No interfaces found! Make sure pcap is installed. Windows 10 Version 1809 (OS Build 17763.194). and Windows Server, version 1809. We encourage you to wait until the feature update is offered to your device automatically. and that was because I had another driver called Win10Pcap installed. I uninstalled that driver and installed WinPcap version 4.1.3. Listening on TAP-Windows Adapter V9. Listening on Tehuti Networks 10GbE Adapter. Setting up session: Client port 54071, Server port 1377. SKey is 0x0fe16636. Listening on Tehuti Networks 10GbE Adapter in promiscuous mode. Setting up session: Client port 54071, Server port 1377. SKey is 0x617f2bcb. Now if only the collector was properly updated to see items. Byren's post here made me go check and see if Win10Pcap was installed when I installed a VPN I was using for things I was doing in Korea. Anyway, yeah it had been. I no longer use that VPN so I uninstalled and re-installed WinPcap version 4.1.3. 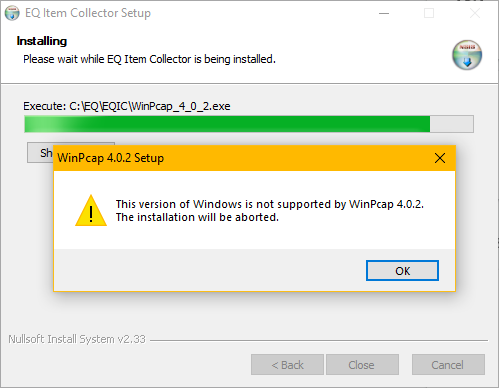 On the new installs for Item Collector, I was doing, I was not selecting to have the installer install the WinPcap, so I never got the error message. I started Item Collector and the Auto-updater stopped at the 3/4 (approximately) updated mark, where it had before. I left the the Auto-Updater running as I was summoned to another room in the house. I came back about 20 minutes later and Item Collector had updated this time, and was at the Setting Screen for the application. So I assume it will run when updated, no profiles are loading. I will test more and update the post. I posted this here so others will have this information. 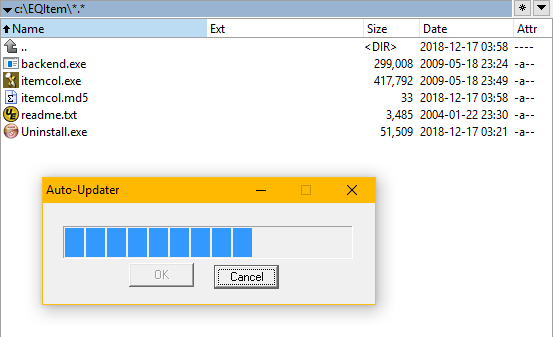 I do not know if uninstalling Win10Pcap, and installing the WinPcap version 4.1.3 solved the Auto-Updater locking while loading, or if that is coincidental. updated a couple of days ago and then not finding WinPcap even though I had always used Win10Pcap before. Win10Pcap was last updated on 2015-10-08 to version 10.2.5002, thus making both programs abandonedware. I am glad that it appears that your EQIC is loading up properly. Rswiders is aware of the winpcap version that the IC uses to install is old. He said he would have to rebuild the installer in order for it to install the latest version of Winpcap of 4.1.3 but I believe you need to buy a license in order to build it with a recent installer package. That is the last version that supports wireless NIC's but unfortunately isn't built to support windows 10. 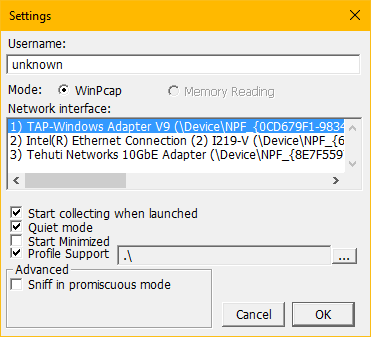 The windows 10 winpcap at http://www.win10pcap.org/download/ doesn't support wireless NIC's, only ethernet NIC's. There is a new version that has been developed at https://nmap.org/npcap/. However the IC would need to be rebuilt in order to support it. I did email Rswiders about this not long ago so we'll see what happens. As far as the installer goes, quitting about 3/4 the way through, I have confirmed this is happening to me as well. It still continues to download but at less than a kb/s so ya looks like that might be throttled back. I'll bring it up with operations. Should I be able to upload chars? I assume no, but I will be able to after Item Collector is updated. If you already have a character on the profile section of the item collector, that can be uploaded to the site if you haven't already. However, if you want to upload a new character that isn't on the item collector profile section, then the item collector needs to be updated to the current patch in order to read character information from EQ. I don't have any immediate news on the item collector at the moment but things are moving forward on it. Once I get more information on more developments, I'll let everyone know. nothing is available on the Muhbis container used to create this item. as possible) while living within the limitations imposed by ZAM. least have a landing page to point to and show others what is needed to make and/or find this item? paid to update the IC program, then effectively Allakhazam is just be a dead website. ZAM has been aware that the item collector has had sporadic updates for well over a year now as I report after every patch the status of the item collector. I've asked for a developer to help with this project from them for well over a year. I proposed several months ago to bring on some C++ developers and had them ready to go to work on the program. I spoke with Rswiders (current item collector developer) if he could train them on how to reverse engineer the game client. He refused. So that went no where. The site currently doesn't have a way to create items or update them. I am working on scripts to do this now. The problem is, the item table has over 200 fields it needs to update with each item. Now we don't have to update all those fields, just the fields that are visually displayed in game for that item. However I still have to create the scripts to be able to edit all those fields. Since I work a full time job (not for ZAM) and have a family I have to take care of in the evenings, this project is going to take some time to implement and test. I was looking through TBL quests and noticed a significant lack of info compared to previous expacs, so I was thinking of downloading the collector to help build out the DB and encountered the Pcap version issue, which lead me to here after some research. Thanks for your dedication for trying to move this forward in your free time. The item collector has been updated for the Feb 2019 patch. IC updated for the March 2019 patch. Listening on Intel(R) 82579V Gigabit Network Connection. Setting up session: Client port 57472, Server port 1634. SKey is 0x58468a19. invalid item (859198537) detected, ignoring. invalid item (-16777216) detected, ignoring. "If you melee us, do we not bleed? if you nuke us, do we not burn? if you poison us, do we not die? and if you wrong us, shall we not petition?"